Price based on User Role for WooCommerce Pro plugin allows you to display WooCommerce product pricing as per user roles. So you can setup different prices for different user groups. Similarly, you can also modify the shipping charges based on user roles. WooCommerce Product prices can be set globally or on per product basis using this plugin. There are different settings like General, Multipliers and Per Product settings in this plugin. Let us understand the General settings in detail in this post. 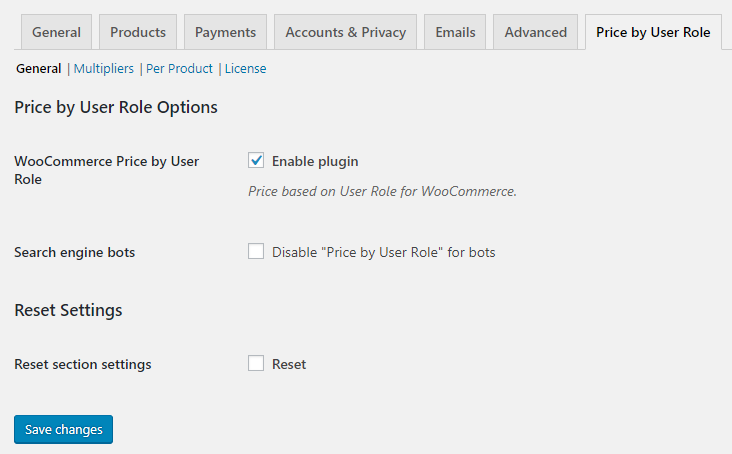 Once you install and activate the Price based on User Role for WooCommerce Pro plugin, you will see a new tab ‘Price by User Role’ under WooCommerce -> Settings. The WooCommerce Price by User Role option is enabled by default. This means the Price based on User Role for WooCommerce Pro plugin is enabled and you can now setup product prices as per user roles. If you disable this option, then the Multipliers and Per Product settings will not be functional. This means the actual prices of the WooCommerce products will be displayed on the front end and not the prices set as per the user role. For instance, say you set the multipliers setting for Admin role to 2. So now when an admin selects a particular product, the price on the front end for the selected product should show double of its actual price set. But if you disable WooCommerce Price by User Role option, then the product price of that product will display its actual price and not the price set for user role. This is because the Multiplier setting is not applicable if WooCommerce Price by User Role option is disabled. When you tick the Disable “Price by User Role” for bots checkbox, it will disable the display of price change if search engine bot is detected. By default, this checkbox is unticked. What are Search Engine Bots? Web search robots which are also called bots are tools used by web search engines like Google, Bing, Yahoo etc. to build their databases. These search engine bots access web pages, index titles, summaries or the entire content of the document in a more speedy and efficient way. For better understanding let us consider an instance. Say you set price multiplier for guests user role to display product prices 2 times higher than the base price. So when users with guest user role visit your site, 2 times higher price than base price will be displayed. But if a search engine bot is detected then in that case it will display the actual base price instead of the modified price. This setting allows you to reset General settings to its default settings. Therefore when you tick Reset section settings checkbox, it will enable the WooCommerce Price by User Role option and untick the Search engine bots checkbox.